Q3930 0490. 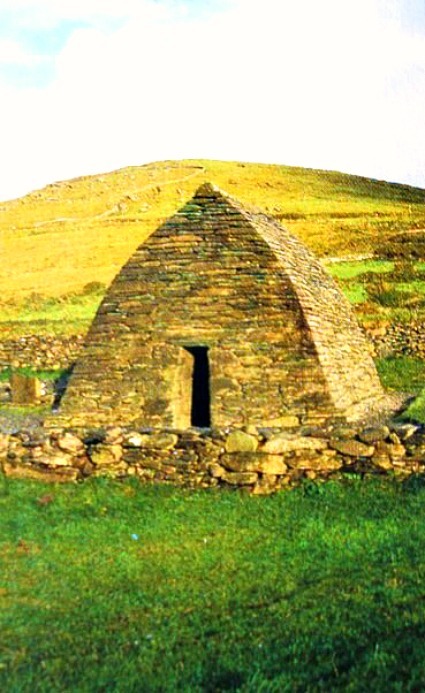 This rather strange-shaped 16 foot-high building stands in countryside to the west of the village of Gallarus on the Dingle Peninsula, west of the R559 road. The site overlooks the beautiful Ard Na Caithe harbour. The building is referred to as ‘the church of the foreigners’; these so-called foreigners being early Christian pilgrims. Local people call it ‘the upturned boat’ because that’s exactly what it looks like but, in fact, it is a small Dark Age oratory-style church, and according to some historians, a temple. The oratory is thought to date from the early 8th century AD but it could be a 12th century building. It is built of shaped stones placed tightly together without any mortar with walls that are over 3 feet thick. Inside, the building measures 10 feet by 15 feet and has a corbel-style, vaulted roof. There is a tiny round-headed window and a narrow door measuring 5 foot 6 inches high. Over hundreds of years the oratory has been well protected from the elements due to it’s curved, slanting shape, allowing rain to run off leaving the building in a resonably dry condition. Gallarus oratory has been called the best example of it’s kind in Ireland, perhaps even the oldest. In some respects it reminds us of the pyramids at Giza in Egypt and, there is quite obviously some association with cosmic energy and spiritual significance attributed to the strange, curved almost pointed little building that it is. It certainly stands out. There is a visitor centre near the oratory. Close by there is a slab-stone standing in the middle of a group of rocks. This 3 foot-high stone has a circle with a cross inside it and an inscription recalling ‘Colum Mac Dine’. The stone may date from the 6th-8th century AD. Categories: Ancient Churches / Chapels, Gallarus Oratory, Gallarus Temple | Tags: Gallarus Oratory in Co Kerry Southern Ireland | Permalink.